This is the minimum script required for a train level. Initially the room floor height that will kill Lara if she makes contact with it is at: 0 or lower, so in order to create the level you have to create a number of rooms at a height of =0 and then place other rooms above them to be able to have Lara moving around the rooms. 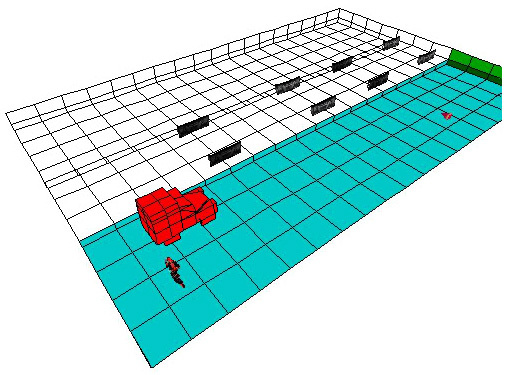 Rooms 0, 1, 2 and 3, are placed at a floor height of 0, if Lara is in contact with the floor she will die, the rest of the rooms with blue sectors are where Lara will safely move. 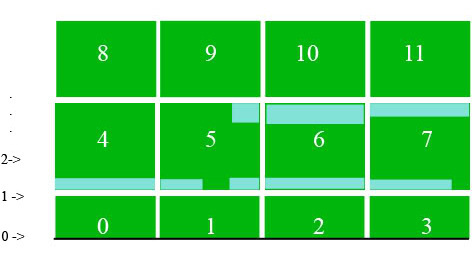 Second are the level position and the width. The train and the exterior have a total of 11 sectors, the recommended sectors for the train is not more than 3 sectors wide and 4 for the exterior rooms at both sides of the train. 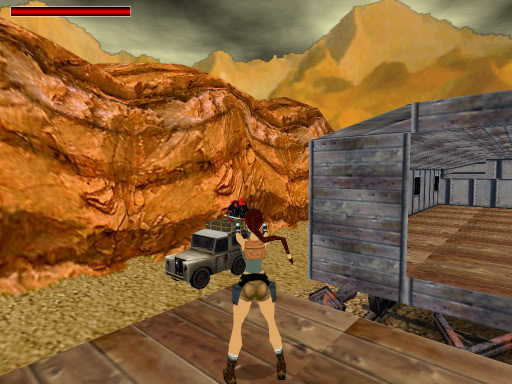 To avoid collision and certain bugs if Lara attempts to jump to the moving mountains she will not be able to reach them. 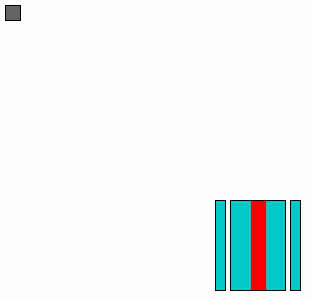 To position the train in the centre of the exterior in movement, it has to be placed in the centre of the 2D Map in the LE and to be moving only in a vertical layout. The train, you can place any textures that you want, just like any other type of level and to be able to see the rails, ground and horizon you have to place the (invisible) black texture in the corresponding sectors. These are the mountain objects that appear at the side of the level having them as walls. They appeare in a continuous way. Their height and width are not important and the length is of 6 blocks for each object, 5 and half at each end. You have to take this into consideration when you make a train level, otherwise the exterior moving horizon will have empty spaces or instead the famous "Mesh 0" of the wad. This are the basics to make a train level. 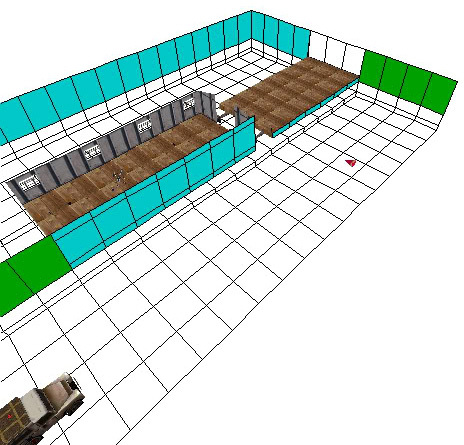 Perhaps the most difficult part is to find the centre of the 2D map where it is needed to place the rooms. 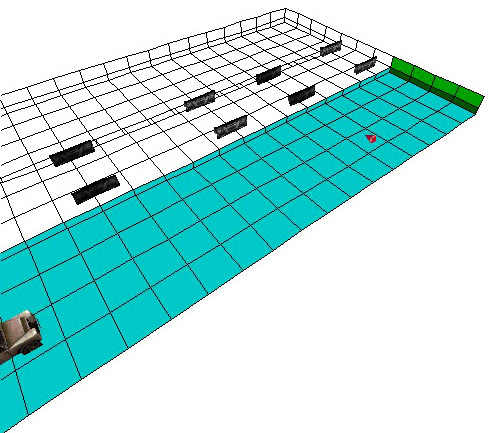 To use the enemy jeep and the baddy 2 objects, both have to be placed 3 blocks away from the train sectors, and set with the same OCB code to both of them. Also you have to place an AI-X1 object with the same OCB code. When the jeep and baddy 2 are triggered the jeep will move in a straight line up to the point where the AI_X1 object is place. After that the jeep will reduce the speed so the baddy will jump into the train. The OCB code given to this objects is 10x. This means that if you place one enemy jeep, the OCB code is 101 and if you then want to place a second enemy jeep, the OCB code should be 102 and so on. NOTE: the jeep, the baddy and the AI-X1 objects have to be placed at a floor height of -1, otherwise the baddy will not jump into the train. In conclusion, ideally the outside rooms at the sides of the train should be placed at a height of floor level -1 in order to place the jeep without any problems at the correct height, in game the jeep will appear at the height of 0 in accordance with the moving exterior. For this tutorial I use the .prj file from Michiel in www.trsearch.org, the wad I've used is the one from the train level of the Last Revelation game. Good luck if you want to start creating a train level.